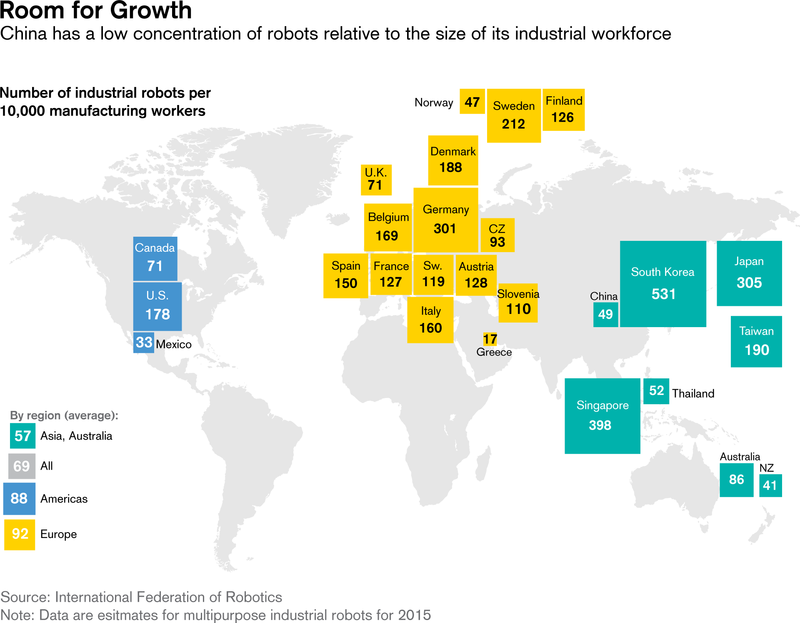 Robotics and Automation – Creating or Taking Jobs? 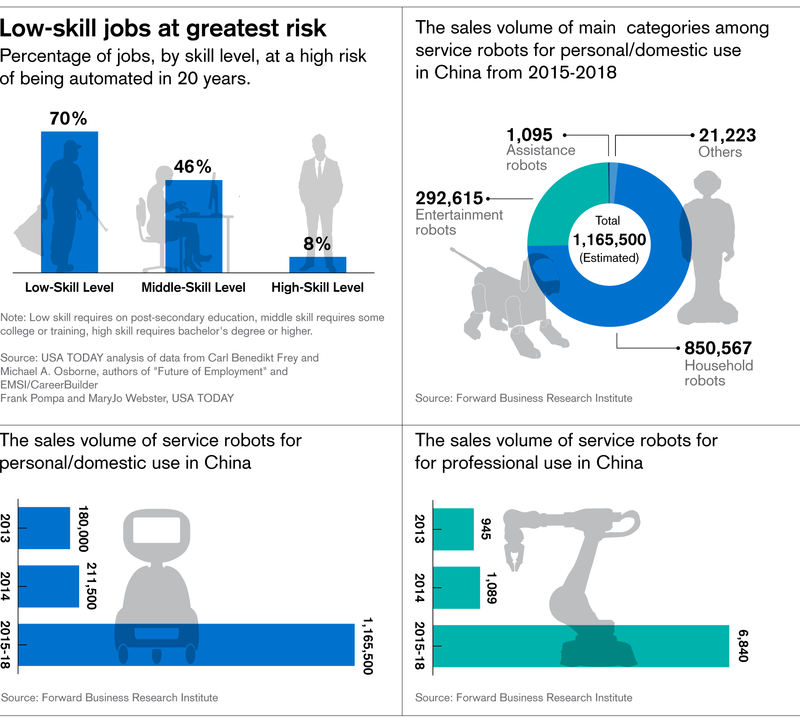 Despite the perception that new innovations in robotics and automation may be a threat to the workforce, Credit Suisse experts expect that over time robotics are likely to create at least as many new jobs as they take. A look at the last hundred years provides a reasonable guide. While societies will likely face some disruption in the short term, governments who are successful in training and preparing their workforce should be well positioned to turn the challenges into opportunities. As robots become increasingly better and cheaper than people at performing many physical and cognitive tasks, some argue that it is inevitable many jobs will be lost to these technologies, while others suggest that many new jobs will be created by this technology. For more and more business owners, the economic rationale in favor of robotics is increasingly making sense. As technologies advance, the cost of robotics and automation is falling and the capability, performance and breadth of use-cases for these systems is rising. At the same time, the human work force appears to be shifting in the opposite direction, becoming more demanding with respect to working conditions and more expensive as minimum wages and benefits rise, and in many cases businesses are struggling to find enough skilled workers for their factories. Automation is not our enemy. Our enemies are ignorance, indifference, and inertia. [Automation] can remove dullness from the work of man and provide him with more than man has ever had before. Throughout history, technology innovations have repeatedly disrupted the workforce and caused pockets of unemployment and social unrest. Furthermore, since the pace of technological innovation has notably accelerated over the last hundred years, first with electricity, then the computer, the semiconductor, the internet and fast mobile communication networks, it might be reasonable to have expected that we would now be experiencing a very high level of what economist John Maynard Keynes described in 1930 as "technological unemployment". In contrast, and perhaps partly thanks to the accelerating pace of technological innovation, the global population has grown fourfold over the last hundred years and life expectancy worldwide has risen, together with the quality of life. Moreover, access to knowledge, the availability of food and clean water, and the ability to communicate with a broad spectrum of people and travel the world in relative safety and freedom have all improved. The American worker wants to be as effective as possible. He wants tools. A robot is just another tool. […] I don't think the question anymore is, do robots create jobs or not? I think we should be asking ourselves how robots can create the most jobs. Professor Howard Choset, Carnegie Mellon University, from an interview with "Next Pittsburg" magazine, January 2017. Most of us find it difficult to imagine the products and services that will be available in the future, as well as the jobs and skills that will be necessary and most valued. Many jobs in the technology sector today did not exist just 20 years ago. System designers, software engineers, programmers, maintenance and support staff are all required to create, build and support the robotic and autonomous systems of today and the services and applications which run on them are already in short supply globally. How many of these roles may themselves over time become automated is still unknown, but there are several academic studies supporting the idea that artificial intelligence and robotics will create more new jobs than they replace. What's more, they should improve productivity and the quality of life for society as a whole. We've got to find a way of getting the opportunities out of technology. What you can't do is stand still – you've got to get on the bus – but in a way which helps as many people as possible. We won't know the true impact of robots and automation on society or the workforce for many years, until the market is more saturated. It seems likely that technology will advance to enable the creation of ever more powerful artificial intelligence capable of learning and teaching itself. This may impact jobs and society faster and more broadly than anything we have ever seen. In fact, several respected technologists and industry experts have suggested schemes to slow down and moderate the impact on society. While their intentions are well meaning, we believe that instead of standing in the way of technological progress, we should embrace robotics and automation technologies. Many workers and employees will need to retrain and learn new skills to adapt to this brave new world of robotics and automation, and ultimately governments, schools and employers may need to drive some of these changes. Is active Robotics and Automation – Creating or Taking Jobs?